The Spruce Hill Community Association (SHCA) is an active and diverse group of residents, students, business owners, and institutions committed to making the Spruce Hill neighborhood a great place to live and work. With the achievement of most of the goals outlined in the neighborhood’s 1995 plan, SHCA called on HFA to lead the community through a new visioning and planning process. SHCA’s goals were to achieve broad participation in the planning effort across Spruce Hill’s diverse community, develop a community vision and associated action steps for the next ten years of neighborhood improvement in Spruce Hill, and have Spruce Hill’s needs and positions adequately represented in the City’s University/Southwest District Plan. 1. Stakeholder Brainstorming and Analysis: A work session with the SHCA Board and other invitees developed a comprehensive, diverse outreach list and strategy for achieving participation of key stakeholders. SHCA broadcast a public invitation to the Community Visioning Workshop. 2. Public Community Visioning Workshop: to develop a Community Vision with written principles and images. 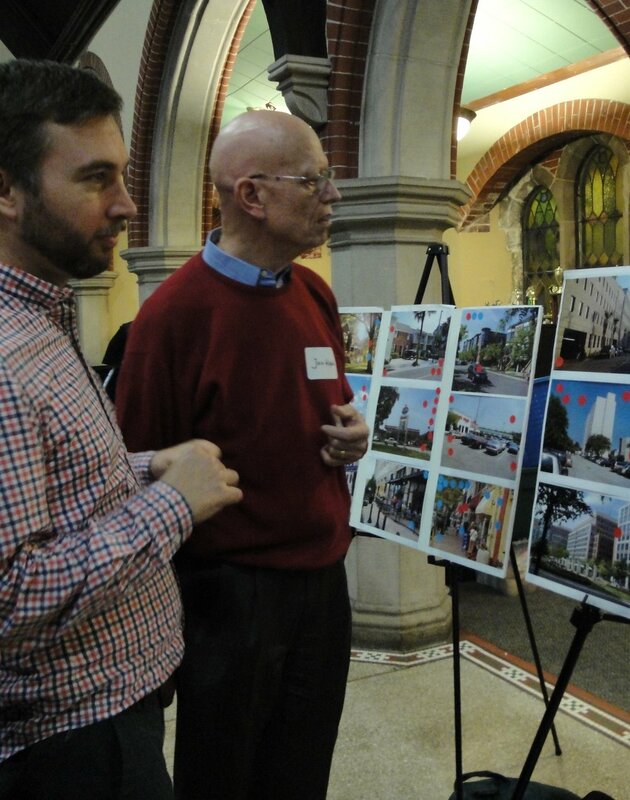 About 90 people interested in Spruce Hill’s future participated in a Community Visioning Workshop sponsored by the Spruce Hill Community Trust. Led by Jennifer Hurley, participants engaged in discussions about a series of visual images from across the country to identify their preferences for the future direction of placemaking and community building in Spruce Hill. 3. Community Vision and Placemaking Principles: Based on listening to the small group discussions and reviewing participants’ written notes and dot voting preferences, Ms. Hurley drafted a Community Vision statement and a set of placemaking principles for the neighborhood. 4. Action Planning Workshop: About 30 community members gathered to review the vision and principles and to brainstorm and develop action steps for continuing the neighborhood improvement over the next ten years. 5. Neighborhood Plan: Based on the workshops and community input, HFA drafted a Neighborhood Plan to help guide SHCA’s neighborhood improvement work over the next several years.